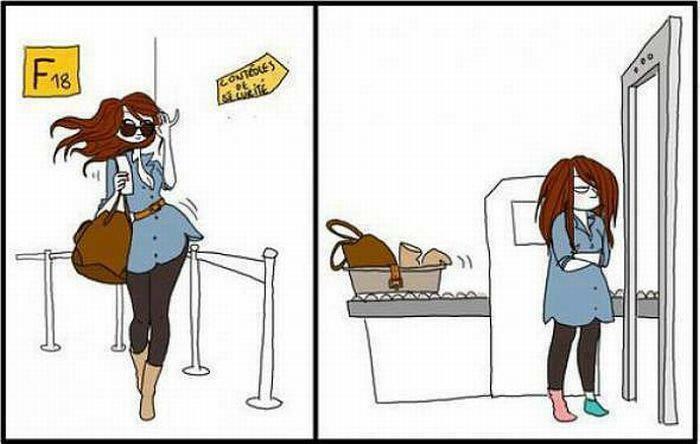 This perfectly describes me going through airport security! Isn't this a riot? My favorite part is the socks. So realistic! In honor of my trip this week I thought I'd post some of my best travel tips. 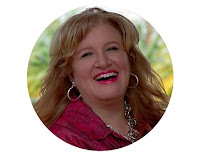 I travel quite a bit for speaking, and a few years ago when I took a former assistant on a trip with me she remarked that I do some things in travel every time that she's never seen anyone do. She thought they were pretty smart. I'll let you be the judge. 1) After the airlines started charging for checked bags, I started only taking a carry on and not checking bags if it was a trip of 3 days or less. In order to take everything necessary, I don't use my normal purse and instead use the largest legal size bag I can find as my "one personal item" that goes underneath my seat. As far as a purse, I bring one that lays flat and doesn't take up much room inside my carry on with nothing in it. When I get to my destination I get the purse out, fill it and utilize it while on my trip until I re-pack to come home. 3) I pack clothes that take the smallest amount of room - my lightest pieces. If it's cold where I'm going, I take a wrap and my leather gloves. I keep the gloves in my bag, but I do not put the wrap in the suitcase, I wear it when I am getting on the plane. Then as soon as I get to my seat I put it in the overhead bin for the flight. 4) To minimize time when going through airport security I don't wear jewelry to the airport. I keep all of it in a small ziploc bag and then when I get through security and settle in with a cup of coffee I sit there and put all my jewelry on. (I wear so many bangles and stuff like that, it always seems to send the sensors off.) Checking in without jewelry has minimized the times I'm detained and therefore screened with the wand or worse. 5) If I'm on a long overnight flight (like a missions trip) I always carry a small packet of facial wipes with me. They really come in handy before going to sleep and when I wake up. I like having the familiarity of being able to wash my face before I go to bed/wake up. 6) I carry an extension cord in my suitcase on every trip whether flying or driving. I don't like to be limited to wherever the hotel put their outlets. I enjoy having plenty of outlets for my flatiron or computer, wherever it's convenient for me in the room. Also if I'm sharing the room with an assistant or my husband, I want plenty of outlets available even though we have to share. 7) I don't take books with me anymore. I used to take a lot -- I can't live without books even on a short trip. On my first trip to Africa I took a bag filled with nothing but books. I will never lug a case of books across the world again. I only take my Kindle now. 8) I take an exercise DVD with me (usually one of Leslie Sansone's Walk Away the Pounds) and use it in the room so I'm not limited to the hotel gym hours. 9) I take some basic first aid items not only for myself, but to help whoever it is that I'm traveling with. This doesn't take up a lot of room but it's uncanny how somebody seems to need something on almost every trip. I've even helped strangers. My kids laugh at how I'm always prepared with this stuff. One time Dustin did a skit at church and making fun of me said, "Who needs some figs? Never fear, you can find them in my mom's purse!" They may poke fun about it , but when they need my help, they aren't laughing so much. 10) I drink more tea than would ever be provided in a hotel room. I take some with me.